With the arrival of blue skies, I was finally able to a close-up shot of a Barn Swallow (Hirundo rustica) with a natural backdrop (vice the white background of the overcast days). The lighting was beautiful and the swallow cooperated by turning its head slightly, enabling me to capture the catch light in its eye. The shadows are pretty minimal, but help to keep the image from being too flat. 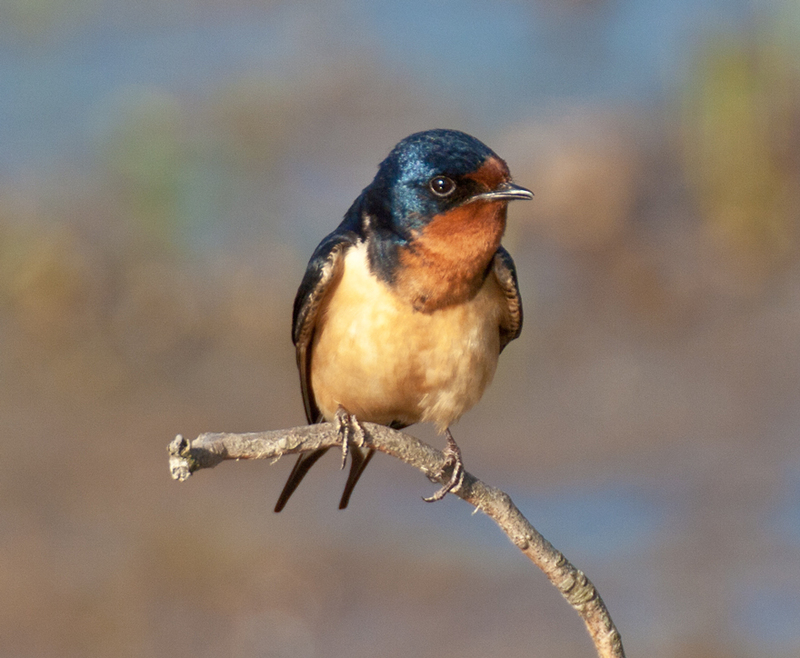 I even like the serious expression on the swallow’s face, as though he had decided that this was a formal portrait. Wow. Thanks, Michele. I feel humbled by your words. Have a blessed Sunday. The grace and beauty of your photography has touched me deeply. Thank you so much. A blessed Sunday to you, Mike. I think this is one of your best, definitely worth hanging on a wall! Excellent shot, Mike. It’s not every day you get such a great opportunity and when they come, to catch it just right! Thanks, Joel. Are you back in the USA now? Brilliant shot, Mike! Your pictures are getting better and better 😀 I love the expression on this bird’s face, and it looks as if he’s dressed up in his best clothes for this portrait. Thanks. I am having a streak of good luck, especially with the swallows. I too love this bird’s expression. Great shot. The bird and the bokeh are really nice. A beautiful portrait, Mike. Well done!